Astronomers like to find cool things. The first Earth-sized planet. The most distant galaxy yet. Two stars that merged while we watched. The coolness factor is certainly one reason why we keep at it – who wouldn’t want to be the first to find an Earth-sized planet, or the first human to see light from a galaxy that’s existed for billions of years? But there’s also a compelling scientific reason to search for these oddballs, because even the anomalies have to fit into our understanding of the Universe. One of the best examples is “hot Jupiters,” Jupiter-sized planets that orbit their host stars closer than Mercury orbits the Sun. The discovery of hot Jupiters surprised astronomers and forced us to reconsider the standard scenario of planet formation that had been developed based on our own Solar System. Sometimes we discover that the oddballs aren’t so odd after all. The more we kept looking, the more hot Jupiters we found, and now it’s looking like the well-ordered architecture of our Solar System isn’t so common. And if we can catch two stars at the exact instant of merging, there are presumably multitudes of other very similar occurrences that we don’t see. And if we can only manage to see one galaxy from the earliest times, then that’s one more way to study the early universe than we had before. The images of this system in four different filters (at four different infrared colors). The images look so different because they were taken with different instruments and at different wavelengths. The M dwarf is the more luminous of the two objects seen. The paper that got me thinking about all of this is about the discovery of dust around a pair of binary stars. These two stars have already undergone some bizarre behavior: they are the end product of a “common envelope phase.” During this phase, the atmosphere of the more evolved and massive star expanded and actually engulfed its smaller companion. This system now consists of a white dwarf and a low-mass star called an M dwarf. The two stars orbit each other, and astronomers have observed both Doppler shifts due to their motion around each other and transits, where one star passes in front of the other, allowing previous studies to determine the masses and radii of both stars pretty well. Using this information and infrared observations, the authors modeled the light budget of the system (called the “spectral energy distribution“) including the light emitted by both the white dwarf and by the M dwarf, and found that models that included just these two stars could not account for all the light they observed. This excess light being emitted is in the infrared (thus the name “infrared excess“) and likely due to dust, which emits at these wavelengths. Dust is not a rare thing to find around evolved binary systems or white dwarfs, but it’s the first time it has been detected in a system like this one. However, the origin of the dust in other systems provides possibilities for its origin in this case. It could have condensed from the M dwarf stellar wind, which is sometimes seen in certain phases of binary evolution. It can also be interpreted as debris from a now-extinct planetary system, which is thought to be the cause of dust around isolated white dwarfs as explained in Susanna’s astrobite. The authors discuss both scenarios and find neither to be completely satisfactory, so this system requires further thought and study. So what do we do with this interesting object? The answer: we ask a lot of questions and keep investigating it in order to enhance our understanding of stellar evolution and the myriad physical processes that shape our Universe. What is the origin of the dust in this system? Can it tell us anything about the properties of the M dwarf? 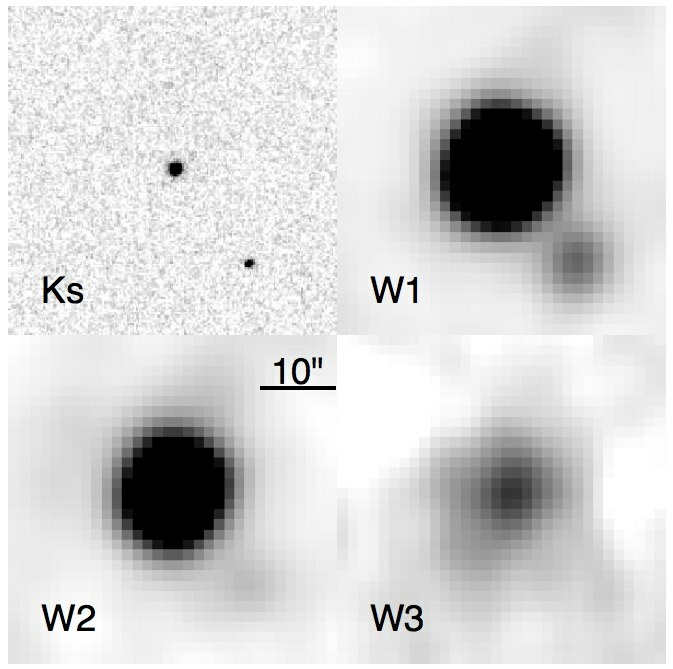 Can dedicated photometric follow-up reveal the structure of the dust ring? And of course: is there anything else really neat about this system waiting to be discovered?